Export Rw3D file to dxf; from there with meshconv.exe to .ply; from there to .u3d with MeshLab and finally from there to a 3D-PDF with MiKTEX: the result was not very suitable. The Bentley Viewer V8i does provide the possibility to just “print” a dxf to 3D-PDF. 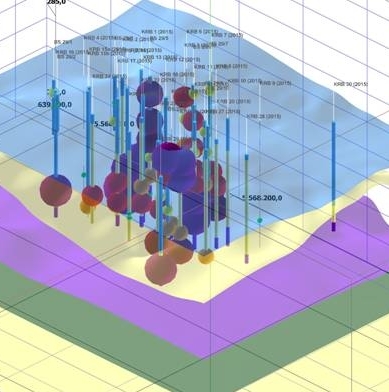 The result is better but there is still a big difference between what you see in the RockPlot3D viewer and the 3D-PDF. Currently I try to use the Tetra4D converter plug-in on the Adobe Acrobat DC. But I am not sure if I am on the right way. If someone already made some experience on this topic and can share that would be very helpful. May be any of the three possibilities would work with the right settings. Thanks in advance. What is unsuitable about the results? Is it the vertical exaggeration? Is it the black and white in MiKTEX? You may want to try the ReportGen program from PDF3D for best results. Thanks for your input. Currently annotations and legends are missing (in the original RockPlot3D they are aside but not shown in the example figure provided in post #1 above). Personally I like the KMZ-files concept much more, but our customer needs 3DPDF. So I am looking for the most efficient way to generate those 3DPDFs with as many information as possible. RockWorks is not exporting the text or legends to 3D DXF, but you may be able to add them manually.